Karina's Kreations: Stampin'Up Candu Cane Christmas! I have my team Christmas party tonight and wanted to give my friends an extra treat. 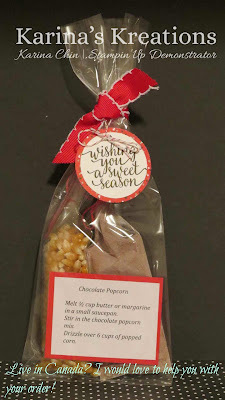 I made a Chocolate popcorn seasoning and placed it in some cute Stampin'Up packaging. It tastes really good too! I was testing it at 9:00Am. Isn't popcorn for breakfast a great idea? The stamp set is called Candy cane Christmas #1420404. I'll be keeping stamp set to use for all my Christmas gifting. I love the greetings!!! I placed the popcorn and chocolate mix in the 2x8" Cellophane bags #141703 and then placed it in a gusseted Cellophane bag #141704. I tied the bag with Candy Cane Lane Baker's Twine#141983 and Real Red 3/4" Stitched Ribbon 3141984. The greeting was punched with a 1-3/4" circle punch #119850 and the 2"circle punch #133782. Some of these items are on sale so click here to start shopping! I hope my friends love this! It's yummy!! !